I have been using Real Salt for years. It’s my favorite sea salt. I use for cooking and simply seasoning my food. If you’re following SCD (Specific Carbohydrate Diet) it is especially important that your foods don’t contain additives and this can make using spices of any kind, even salt, difficult. 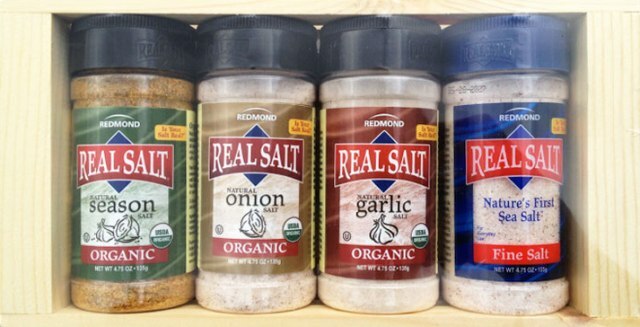 Recently Real Salt sent me samples of Real Salt along with their Organic Seasoning Salt along with their Garlic Salt and Onion Salt. One thing that I really like about Real Salt is the lack of additives. Many salts have additives like Dextrose, Sodium Bicarbonate, Calcium Silicate, and Potassium Chloride and that’s just to name a few. It’s always important to read the label. The Real Salt plain sea salt is perfect for SCD. It’s just salt and nothing else. Real Salt comes from a large salt deposit 300 below the surface of the Earth in Utah. You might be wondering why there is sea salt in the Southwest United States, but of course Utah is also the site of Great Salt Lake, These are remnants of an ancient sea that covered the land and the salt deposit was left during the Jurassic period. So in a way it’s like getting a little piece of the Earth’s history. Real Salt contains trace amounts of minerals and is processed without the use of additives, chemicals, or heat. I like the idea of minimal processing in all of my foods, so that is why I like Real Salt. So, lets get to the seasoning salts. If you’re being strict about SCD you’ve probably been avoiding seasoning salts. Most seasoning salts have anti-caking agents and other additives, but Real Salt is just the salt and organic spices. The Organic Seasoning Salt contains Real Salt, Organic Onion, Organic Corriander, Organic Mustard, Organic Black Pepper, Organic Paprika, Organic Celery Seed, Organic Tumeric, & Organic Parsley. No “natural flavors” or the generic “other spices” that I’ve found on other seasoning salts. The garlic salt contains salt and organic garlic and the onion salt contains salt and organic onion. Unlike other garlic, onion, and seasoning salts I feel comfortable using these with SCD. However, if you want to keep things plain the regular sea salt is still great. For more info about Real Salt visit their official site.